Porcupines are intriguing animals, their prickly nature is well-known, but few people encounter these mostly nocturnal and secretive creatures. Most people are likely to see only the remains of porcupines struck by vehicles as they forage along roadsides in spring. Porcupines happen to be drawn to the rock salt use to de-ice roads through the winter. When the salt soaks into twigs and vegetation along the road edges—it becomes an unintentional attractant that can place the foraging porcupines in harm’s way. Their strong drive for salt is partly the result of a high potassium-to-sodium ratio in the spring vegetation they eat, which must be balanced out. If you live in porcupine country (western and northern U.S. including Alaska, and Canada), be watchful for porcupines when driving in early spring. In winter, though, it is more your trees that you’ll want to be watchful over—and a few other things porcupines find tasty. 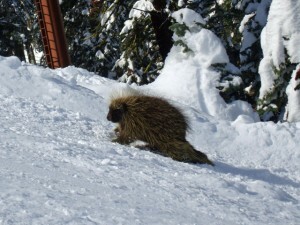 Read on for some background about porcupines in winter, and helpful tips for living in porcupine country. Porcupines use well-worn paths to make their way to favored dining places. While bears and woodchucks fatten up for a winter spent in hibernation, porcupines fatten up so they can tough out the long, cold winter wide awake. 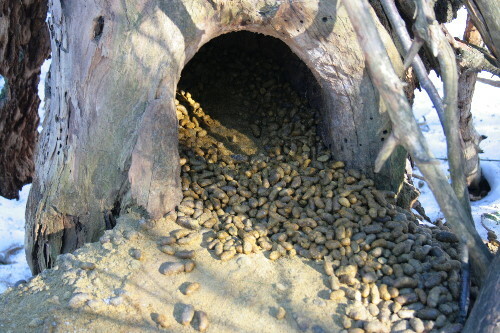 Because the foods available in winter have too little nitrogen for them to maintain their body weight, they have to start the winter much heftier than normal. Another preparation they make for winter is replacing their underfur with a thicker layer. They can also control their fur, guard hairs, and quills independently of one another—erecting underfur and guard hairs and pressing the larger quills against their body—creating air pockets that amplify the overall insulating effect. When winter arrives, they spend their days huddling in rock, decayed log, or hollow tree dens. At dusk, they meander along well-worn paths or snow trails to favorite nearby trees where they feed throughout the night. The porcupine’s vegetarian diet is no threat to plants and trees in most seasons. In winter, though, they begin feeding on cambium, the inner bark of trees, so if you live in porcupine country, protection of certain trees may be in order. While they may eat any species of trees in their range, they tend to have geographic and individual preferences. They also focus on trees near their dens, which tend to be in relatively remote areas. Thus, trees in suburbs are rarely bothered, but trees on properties in rural settings may experience some porcupine damage. The porcupines strip the bark off the tree’s upper branches, munching all the way around. Their feeding pattern eventually creates a stunted and “witchy” looking tree. Whatever problems people may have with these alterations to a tree’s form, porcupines find that trees they have “worked on” are easier to climb than trees that have grown to full height. Plus, the low, thick crown makes it easier for them to harvest food and find shelter from the wind. If pine trees are available, they’ll eat the twigs, buds, and needles of these trees, giving the bark of deciduous trees a little relief from their stripping and munching activity. Porcupine dens are readily recognizable by the latrine located just outside the entrance. Most people never encounter porcupines or evidence of porcupines feeding in the trees on their property. If you do have porcupines living near you, though, and have concerns about your trees—perhaps a small orchard, or maybe a few specimen trees you particularly like—it is relatively easy to protect them. An effective solution is to place a band of metal flashing around the tree’s trunk. It should be about 24-30 inches wide and you want to place it three feet above the ground—if snow is likely in your area, place it three feet above the typical snowfall level. With this shield in place, porcupines will be unable to climb the tree, and thus they will not be able to strip the bark. Make a note to yourself to remove the band when the trees leaf out in spring, so that insects don’t accumulate beneath it and damage the tree. It’s also important to take the flashing away in early spring so animals like squirrels can access the tree for denning and raising young. Porcupines are known to chew on a number of other things that may be accessible to them in your yard. Examples include the handles of garden tools, which will have salt from human sweat on them; and car engine hoses and coated electric wires, which contain other substances porcupines find appealing. In the case of tools, a simple solution is to make sure they are properly stored in your shed or garage when not in use. If you are concerned about possible porcupine damage to your car and cannot park it in a garage at night, applying a capsaicin-based repellent to hoses and wires to discourage chewing. 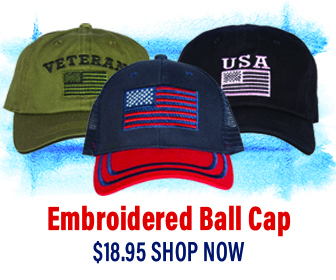 Living in porcupine country may come with a few challenges that people living elsewhere do not have, but none that are insurmountable. And, unlike those living in cities or suburbs, you may get an opportunity to see one of these fascinating animals firsthand—you may even see a mother porcupine, teaching her young the ways of the woods. If you do, enjoy the moment, because porcupine sightings are all too few and far between.